On October 10, 1925, a small group of eighteen electrical workers was granted a charter from the International Brotherhood of Electrical Workers and formed IBEW Local Union 363. The founding members of this new local union would meet at the Odd Fellows Hall in Nyack, NY. The construction of Camp Shanks in Orangeburg greatly increased the demand for trained electrical workers in Rockland County and provided employment opportunities for the expanding Local 363 membership. That regional expansion continued with the construction of the Tappan Zee Bridge, the NYS Thruway, and the Palisades Parkway. In performing its primary duties as a labor union, Local 363 established and successfully maintained a level of wages and benefits for its members that were suitable for a skilled worker. A self-funded health insurance system and a secure pension are some of the benefits that have developed over the years. 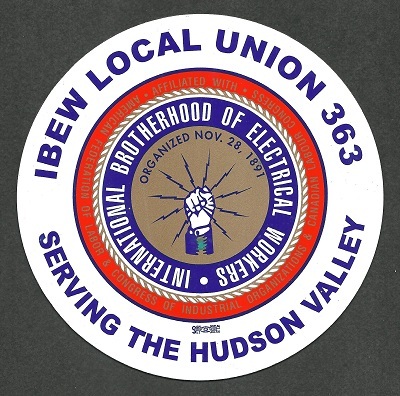 From 1990 to 2005, Local 363 was under the leadership of Joseph Maraia and Local 363 expanded its jurisdiction through a series of mergers with other IBEW locals and now serves Rockland, Orange, Putnam, Dutchess, Ulster, Sullivan, Delaware, and Greene Counties. To meet the increasing demand for trained electrical workers and to keep pace with rapidly changing technology, Local 363 constructed a new state of the art regional training facility in Harriman, NY. Along with its strong commitment to the community, Local 363 has a rich history of participation in the political process. John Maraia was Business Manager of Local 363 from 2005 to 2011 and persevered with the same dedication as his predecessors. From educating members on issues important to workers, to actively supporting candidates for office, Local 363 continues its longstanding tradition of political action that John demonstrated during his tenure. Today Sam Fratto, a well known labor leader throughout the Hudson Valley, is the Business Manager of IBEW Local 363. Business Manager Fratto has been a staunch protector of workers rights and the IBEW for over 25 years. He has situated Local 363 at the forefront of the IBEW Code of Excellence program instituted by IBEW International President Ed Hill. Sam Fratto’s far-sighted and progressive policies have also positioned the IBEW on the inside track to rebuild New York’s Hudson Valley resort community. Since its inception, Local 363 has maintained a strong commitment to the community. From charitable contributions for projects like a new wing at Good Samaritan Hospital and providing volunteers to install new lighting for the Boy Scout Council in Dingman Lodge, Local 363 has never lost its sense of community. Today, Local 363 holds yearly events such as a blood-bank drive for the American Red Cross and a sponsorship of the American Heart Association’s Walk-for-Life. Sponsoring Little League teams, lighting for playgrounds, and electrical wiring for Habitat for Humanity, are just a few other ways Local 363 continues to support the community.